his full size single stage, 28 gallon compressor is designed for the serious user of air tools. With a pro-grade 5.0 HP motor and deep-well oil lube pump, the PCE6280 can perform for hours on end and work with virtually any air tool in the tool box. Producing 115 PSI maximum pressure and CFMs of 6.2 @ 40 and 5.2 @ 90, the produced air flow and torque will mean that few jobs will be left undone. Add an electro-statically painted tank surface, dual pressure gauges and a brass quick-coupler along with both a compact handle and roll about wheels and one can quickly see why the PCE6280 is a contender for inclusion in any serious handymans tool arsenal. CSA Approved, 15 Amp, Induction Oil Free, Copper Winding Motor for Extended Life, 3400 rpm Motor for Greater Air Flow, Extension Cord Storage Bracket, Dual Coupler Connections, Circuit Breaker reset Switch, Scratch Resistant Rubber Feet, Easy to Read Gauges, Adjustable Air Regulator Dial, Powder Coated Paint Finish. This Industrial 10 HP 2 Stage V4 1 Phase horizontal 80 Gallon Piston Air Compressor is designed for up to 50,000 hours of commercial or industrial use with proper maintenance. This unit features our low RPM pumps and delivers 38 SCFM @ 100 PSI. Our unit is SUPER COOL and SUPER QUIET! This series offers all the power and craftsman ship as our Industrial Plus series without all the extra cost. EMAX Air Compressors require less maintenance, service and downtime than any other compressors in the Air Industry's. All our Products are designed with exacting tolerance and specifications to deliver all the power that is needed at the jobsite, garage or shop. EMAX Compressor industrial duty Gas Driven Air compressor series I number one in its class! These units are powered by one of the best name brand gasoline engines on the market, Honda GX series. Our full cast iron 2 stage compressor pumps are designed for longevity and power! This gas driven compressor comes with a 5 gallon mounted gas tank. All this is mounted on a 60 gallon power coated ASME certified air receiver. 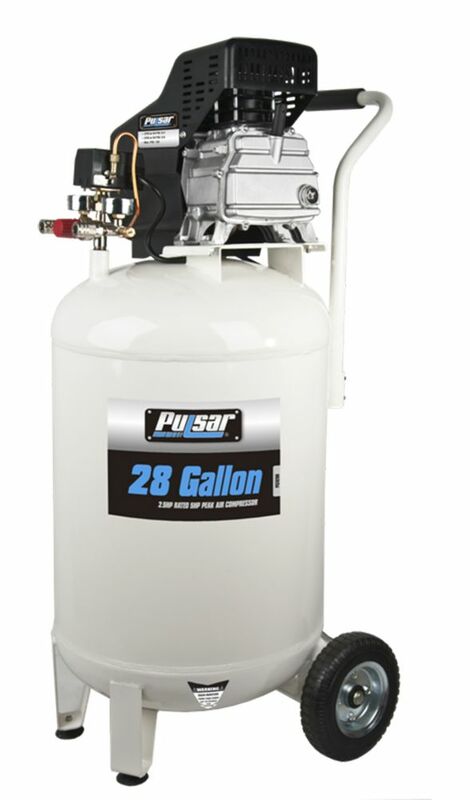 Pulsar 28 gallon Air Compressor his full size single stage, 28 gallon compressor is designed for the serious user of air tools. With a pro-grade 5.0 HP motor and deep-well oil lube pump, the PCE6280 can perform for hours on end and work with virtually any air tool in the tool box. Producing 115 PSI maximum pressure and CFMs of 6.2 @ 40 and 5.2 @ 90, the produced air flow and torque will mean that few jobs will be left undone. Add an electro-statically painted tank surface, dual pressure gauges and a brass quick-coupler along with both a compact handle and roll about wheels and one can quickly see why the PCE6280 is a contender for inclusion in any serious handymans tool arsenal. Pulsar 28 gallon Air Compressor is rated 1.0 out of 5 by 1.